Computers have been a part of my life for as long as I can remember. Partly through a child’s imagination of what computers and robots could be, and also because of a life-long interest in technology. My parents, very early on, realized that computers were going to help them in their professional and personal lives. They also understood what a part these machines would have on their son’s futures. My mom was a school teacher during my very young years, and as anyone my age will tell you, that means she was exposed to the Apple ][ (or II +/c/e). I think some combination of the educational influence that Apple had and also the marketing of computers to home users appealed to her. My parents decided to get a computer for us to use at home which would help give us an advantage at school. They bought an Apple clone, due to the low price. That computer was a VTech Laser 128, which was, in some ways, superior to the Apple II. 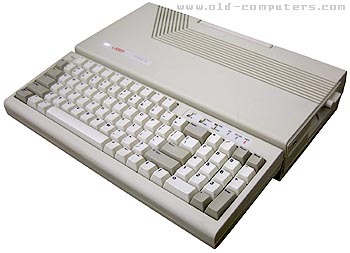 It had an built-in numeric keypad (like your modern desktop keyboard) as well as an expansion slot. VTech’s Laser 128: My very first computer (image courtesy of old-computers.com). I had a number of games (Zork, mostly) and was able to write some simple programs in BASIC. The most ambitious thing I ever attempted write was a full screen, color animation of a Tolkien-esque dwarf swinging a battle-axe downward. I never did get the animation to work. It ended up being a seizure inducing series of slowly drawn series of multicolored lines which would then flicker in some sort of violent manner. I took me over two days, and unfortunately, unless my mom has some 5-1/2″ disks and graph paper stashed away somewhere, it has long since been lost. 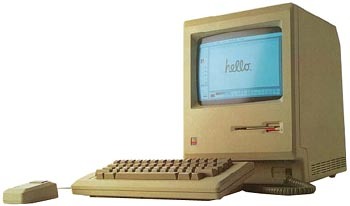 The original Apple Macintosh computer (image courtesy of old-computers.com). My parent’s love for Apple hardly ended with my Mom’s interest in the Apple II. Very early on, they purchased a Macintosh computer for my Dad’s law practice. It was a neat little box, which had the guts build into the monitor, rather than the keyboard (as I was used to). My parents even had a special computer desk for it, with a multicolored Apple sticker on one end. I was extremely hurt to find out that there was no programming to be done on this machine. However, this feeling was lost once I discovered the programs it came with: MacWrite and MacPaint. My parents had exposed me to a new world of computers and my Laser 128 sat without use for a long time (it would later be donated to a local elementary school). My brothers and I each had a small collection of 3-1/4″ floppies (or Mac disks, as we called them). I even got to be quite hand with MacPaint, if I do say so myself. As computers became more common in the work place, my parents began to notice a glaring difference between all of my father’s legal briefs and the others: Chicago versus Times New Roman. Even when using the New York font on the Mac, you could spot the difference quite quickly. While there were no doubt more technical and less expensive ways to overcome this, my parents made a decision to invest in a IBM-compatible computer (there were other considerations involved, of course). This would allow them to use WordPerfect and Aldus Pagemaker, two very hot programs of the time on Windows 3.1. They bought a computer from a mom & pop computer store (they all were in those days) in Knoxville. It had such luxuries as a modem and hard drive, which while both available on the Mac, weren’t features we had at the time. Anyway, having a PC at home would later make me pretty popular with friends, who didn’t feel like hanging around the school library after hours to do their papers. Several of my high school classes made use of computers for reports, which arguably made Typing class the single most important thing I learned in four years of high school. It would have been at least one or possibly two PC’s later that we tried using an online service via the modem. There were only a few then, and no internet. There was, if I remember: CompuServe, Prodigy, and American Online. I believe we chose Prodigy. It was a DOS-like interface with some BBS’s and maybe a few other features. It wasn’t much to look at, didn’t have many features for kids at the time, and was incredibly slow on a 1200 bps modem located in the mountains miles away from the telephone central office. Needless to say, we never used anything other than the trial log-on. I wouldn’t use an online computer for a few more years, until I began college. My first name-brand PC, a Sony VAIO PC70. In an early attempt at wishing for on-the-fly plug-and-play peripherals that USB would later bring us, I fried my computer while attempting to connect a parallel printer cable. While it was on. Standing in my carpeted bedroom. Fortunately, I was living in Nashville on a co-op at the time, and was able to (with some help from my Dad) go buy a new computer. Tired of the mom & pop perpetual-upgrade boxes, I went with a brand name. I bought a Sony VAIO desktop, the first one ever. It was a big purple tower with a matching purple monitor (the PC-70). 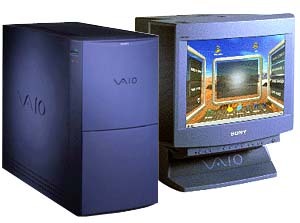 The VAIO was actually ahead of it’s time in many respects, not the least of which was the fact that it wasn’t beige. Also, it had two USB 1 ports before Windows 95 or Apple Mac OS either supported them. There weren’t even many USB devices to be found in 1997 even if the operating systems could support them. It also had a kind of work environment on top of Windows, called VAIO space (seen in the photo to the left). It was useless, but showed Sony’s willingness to put extra effort into making top of the line computers. I had also been a big fan of CNET, and had finally decided I was going to drop the university’s dial-up modem pool in favor of a real ISP. I would, like all of my peers, change e-mail addresses and ISP’s more often than home addresses over the next several years. In the next several years, I would learn a little HTML and begin to dabble in the idea of having my own web page (later to be known as web sites). I began to use Microsoft’s FrontPage to write everything, and would continue to do so for several years. While I had some (crap) online, I registered JasonColeman.net in late 2000 and actually put up an entire site. Then, after leaving graduate school and getting a real job, it went untouched for most of the next three years. Finally, in December of 2004, I decided that using a blog format would allow me to update the site easier and more regularly in the fashion I had always intended. Much of the content from that old site can be found in the static pages on this site. I don’t remember a time when I didn’t have a computer in my home, either as a child or as an adult. As I grew up, so did personal computing. When I needed computers for a new task in life, they were expanding to fill that need; whether it was drawing on MacPaint as a child, writing term papers in WordPerfect, writing programs in VB, or using spreadsheets in my research. As my world view expanded and I networked as an adult, so too did the world of computing through local networks and the Internet. Personal computing is as much a part of my everyday life as television or driving have ever been. It wasn’t my generation that invented the technologies you’re using right now to read this, but we were the ones who made it mainstream. I’ll never be a famous programmer or tech visionary, but I will always strive to stay on the cutting edge of technology because I grew up on that edge, thanks to my parents. It is the world I grew up in and the world I live in.